A snowy Tuesday December evening! We received about seven inches of snow over the weekend. It makes for good sledding. Daughters Susan and Verena mixed up some biscuits and then went out sledding with son Joseph, 14, and daughter Lovina, 12. I’m making sausage gravy and trying to write and watch the gravy at the same time. The biscuits are baking, and son Kevin, 11, is frying the eggs. He learned how to fry eggs in cooking class at school, so he is glad to try his skills at cooking here at home. Son-in-law Mose is hunting tonight. Son Benjamin just came home from work. Husband Joe is taking a shower. Daughter Loretta, 16, went with her special friend Dustin’s family to their school Christmas program. Dustin’s youngest sister, Rebecca, is in the program. She is in kindergarten. She was born nine years after the youngest of her six siblings, so is the only one still in school from their family. It sure is different now that we don’t have any children in elementary school who have a Christmas program. Our youngest child, Kevin, enjoys middle school, where he switches classes every hour. He says the day goes much faster. This is now after supper. Some of the children are playing Poppa’s Pizza Topple. It’s a game where you have to balance the pizza toppings on the pizza, which the pizza guy is holding. Susan still comes over to our house to read a chapter from the Bible every day with the rest of her siblings. They each take turns reading a verse. I feel so thankful that they read the Bible every day. Life is so busy, and it is so often pushed aside. How comforting to read the words written by God! As parents, we have a great responsibility, and I realize this more and more as the children get older. We can’t say enough prayers for them as they grow up in a world filled with so much hate and sin. May God give us the strength to stay faithful to his will. A store-bought birthday cake is a special treat in the Eicher family; this one is for daughter Verena’s 19th birthday. 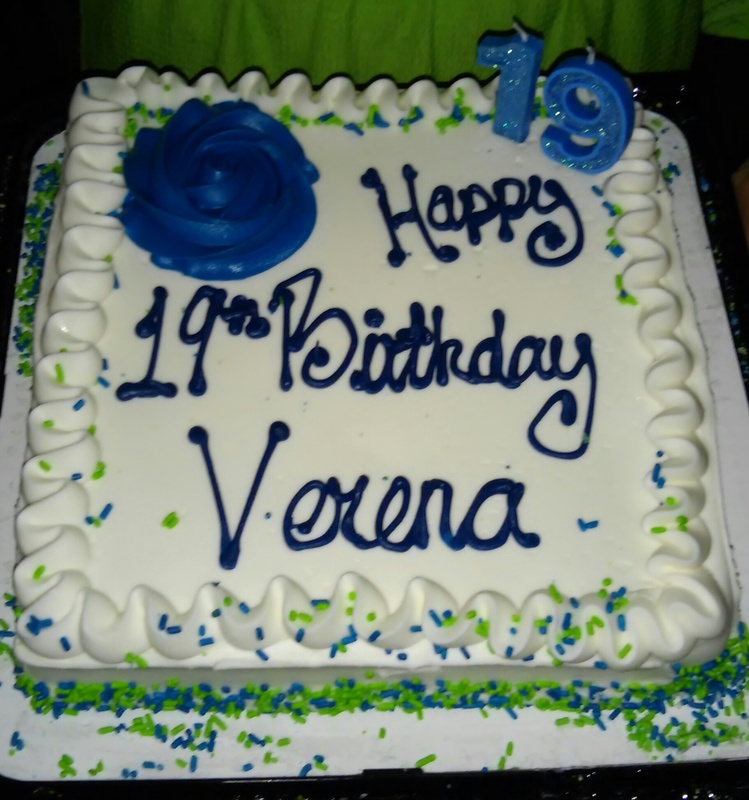 Daughter Verena turned nineteen on Sunday. Our married daughters and family and Dustin were here Sunday evening in honor of her birthday. On the menu were chili soup, hot wings, jalapeño poppers, macaroni salad, cheese, cake and ice cream. The men fixed the hot food out in the kettle and on the grill. The girls and I enjoyed the break and took turns holding dear little Abigail. She giggled out loud for the first time. All those “firsts” are so precious. I want to thank all the readers who have sent cards and money since my surgery. It is greatly appreciated. Hospital expenses are high these days, but our health cannot be neglected all the time. I do feel so much better since the surgery. I want to get to my sewing again. The boys need more pants. I will sign off for this time. May God bless each of you! And may all of you with health problems recuperate to a complete recovery! We often take good health for granted until we don’t have it. I will share the recipe we use almost all the time for our biscuits. The mayonnaise and milk give these biscuits a very moist texture. I think that is why they are so popular with the children in my house. Preheat oven to 375 degrees. Grease a baking sheet or 12 muffin cups and set aside. In a large bowl, combine the flour, baking powder and salt. Blend in the mayonnaise, milk and sugar until the mixture is creamy. Drop by the tablespoon onto the baking sheet or fill the muffin cups two-thirds full. Bake until golden brown, 18–20 minutes. Makes 12 biscuits. 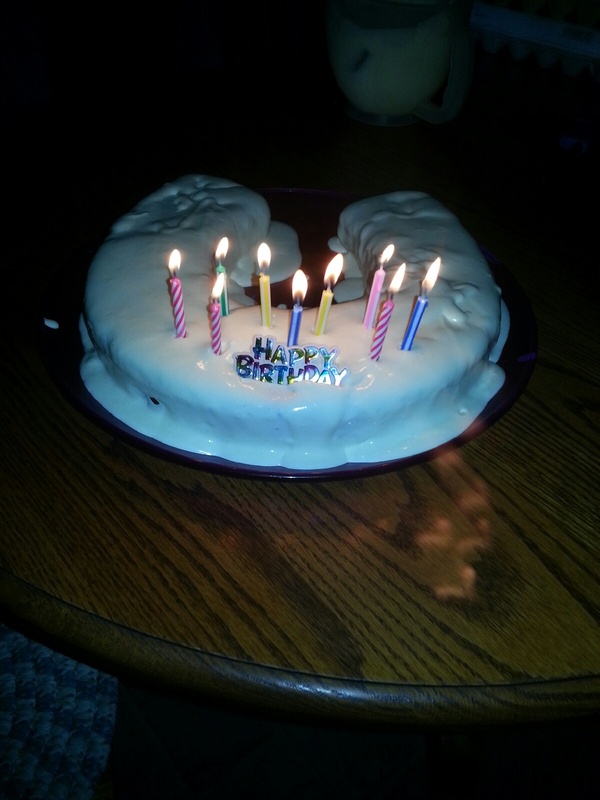 Lovina Eicher is an Old Order Amish writer, cook, wife, and mother of eight. She is the co-author of three cookbooks; her new cookbook, The Essential Amish Kitchen, will be published in 2017. Readers can contact Eicher at PO Box 1689, South Holland, IL 60473 (please include a self-addressed stamped envelope for a reply) or at LovinasAmishKitchen@MennoMedia.org.